Baileys Barn in Bonsall, near Matlock, Derbyshire sleeps 2 people. Bailey’s Barn near Matlock Bailey’s Barn near Matlock is cosy and has a real ‘wow’ factor; this charming, semi-detached barn conversion is located in the village of Bonsall and is a delightful and picturesque place for a relaxing getaway or a walking/cycling holiday in and around the Peak District National Park. Bailey’s Barn, dating from the 1700s, is a truly wonderful place to stay. The feel of the barn is welcoming with a collection of original and limited edition art, a cosy wood burner, and very high ceilings revealing the ancient beams supporting the barn roof. With ultra-controllable instant electric heating and well-furnished throughout, it offers an open plan living and kitchen area, and a separate bedroom (choose from super king-size or twin bed layout) with an en-suite. There is a private off-road parking space, bike storage and courtyard garden with feature lighting and an original ancient cheese press. Bailey’s Barn is set all on one level, with level access and 83cm doorways. The thoughtfully designed stone barn is one of the very few homes in Bonsall which is inside the Peak District National Park as well as Bonsall Conservation Area. Ideal for walkers, couples and dogowners, it is within an easy stroll of fields, footpaths and The Limestone Way. Bailey’s Barn is well set up for walkers, with a useful heated cupboard for drying coats and boots and an outside tap for washing wellies and dogs. The property is most welcoming for dogs, with a special welcome gift and cosy clean bedding available. Set approximately 900 feet above sea level, on top of the highest hill for many miles around, the views are outstanding and the walking and cycling extremely rewarding. There are many trails which start straight from the barn – it is an ideal opportunity to park-up, put the car keys away and just relax! Bonsall is a historic village, within 5 minutes’ drive of Matlock and Matlock Bath, and local to Chatsworth House and many other historic attractions. Based in the Peak District, the barn is a great base from which to explore the beauty and majesty of the region’s peaks, dales and rivers. With its own quirky traditions such as Bonsall Carnival, International Hen Racing Championships, ancient buildings and History Trails, Bonsall is a delightful find with two pubs and a lovely tea room all within half a mile or so. The owners live on-site, and are on hand to help with any queries, give advice about dog walking and any other questions. The shop and pub are 500 yards from Bailey’s Barn near Matlock, with the restaurant 2 miles from Bailey’s Barn. Bedroom: With zip and link super king-size bed (can be twin beds on request) and en-suite with shower cubicle, toilet and heated towel rail. Electric heating, electricity, bed linen, towels and Wi-Fi included. Logs for wood burner available locally. Welcome pack. Enclosed courtyard with sitting-out area, garden furniture and firepit. Bike store. Private parking for 1 car. No smoking. Holidays at Baileys Barn run from Friday to Friday. Pets allowed at Baileys Barn. For a better idea of where Baileys Barn is, you can see Baileys Barn on the map below. Baileys Barn is in Derbyshire; should you be on the lookout for a special offer, you can find all the special offers in Derbyshire. It's always worth checking to see what is on offer at the moment. 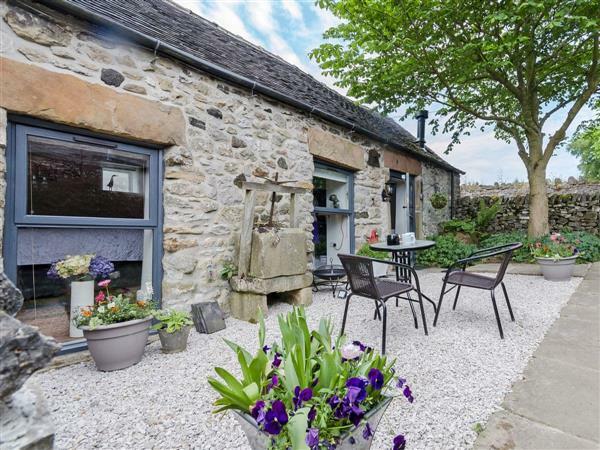 Do you want to holiday near Baileys Barn (UK4130), you can see other cottages within 25 miles of Baileys Barn; have a look to find your perfect holiday location.